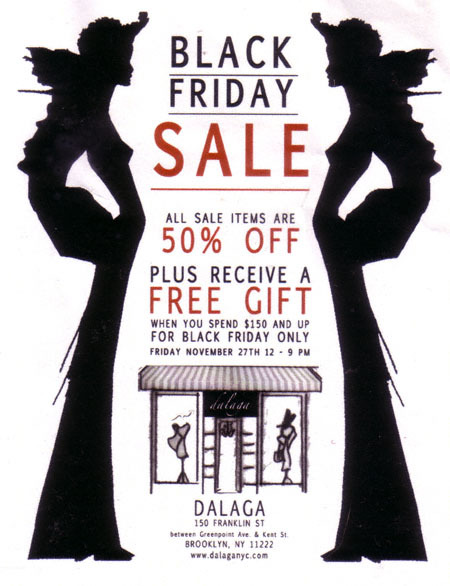 TOMORROW: Black Friday Sale At Dalaga & More! I have the pleasure of calling co-proprietors of this business neighbors. They’re not only great folks but their offerings are quite lovely and reasonably priced. Check it out! November 27, 2009; 12:00 – 9:00 p.m. While you’re on Franklin be sure to pay a visit to the many wonderful businesses located there. To name a few: Tommy and Roy, my favorite Alter boys; Word Books, Pentatonic Music, Permanent Records and Kill Devil Hill. Be sure not to overlook Manhattan Avenue while you’re at it. Franklin Street does not great Greenpoint holiday shopping in its entirety make. Do your part to help the Garden Spot’s indie/mom and pop businesses thrive: buy local this holiday season!